Acronym for Strategic Defense Initiative. The SDI was a military research program proposed by President Ronald Reagan in March 1983 for the purpose of defending the USA against ICBMs. Popularly referred to as the Star Wars Program, its goal was to intercept incoming missiles during midcourse using space and ground based nuclear powered X-ray lasers, subatomic particle beams, and computer-guided projectiles fired by electromagnetic rail guns, all controlled and coordinated by supercomputer. 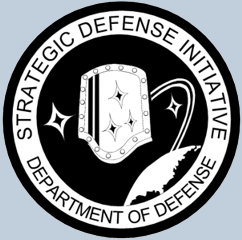 In 1993, SDI was allegedly abandoned and replaced by the Ballistic Missile Defense Organization, a less costly program using ground based antimissile systems. However at the time this article was written. directed energy weapons ( DEW ) research is still being carried out and progress is likely much farther ahead than the general public is aware of. For example during the mid 1970s a popular science journal described a laser rifle powered by a backpack energy supply that could set an enemy soldier on fire well over a mile away. So by the time the SDI came along ten years later, there must surely have been advances in both power and range. Then in the mid 1980s the DoD released SDI test film footage showing an empty ICBM casing on the ground being destroyed by a distant DEW. Following that, the SDI program continued for another ten years. Although current DEW specifications are classified, it is not difficult to extrapolate how much they have evolved since then. At least one is known to be installed in a modified Boeing 747. However information on this topic is difficult to locate. At the time this entry was written, an Internet search for SDI resulted in a very high percentage of pages that were expired or no longer available. Even the DoD website offers very little information. It is also interesting to note that several scientists who worked on the SDI project have since met with untimely and unusual deaths. There has also been speculation in the ufology community that the SDI and similar programs, in particular those that focus on DEW technology, are designed for more than missile defense. During his speeches, President Ronald Regan alluded on more than one occasion to an extraterrestrial alien threat. For example in 1987 during a speech before the entire UN General Assembly, Reagan said, "Perhaps we need some outside, universal threat to make us recognize the common bond that unites all humanity. How quickly our differences worldwide would vanish if we were facing an alien threat from outside this world. And yet I ask you, is not an alien threat already among us?" To the average person, Regan's question is usually interpreted as purely illustrative. However, it is common knowledge among ufologists that UFOs have been tracked in space by military RADAR, observed over restricted air space, and chased by military aircraft. If civilian researchers have learned this much, it is a safe bet that defense agencies know even more.